Properties in Mohammed V University of Agdal average 4.7 out of 5 stars. Property 24: Pay gate in a traditional and authentic village of southern Morocco. 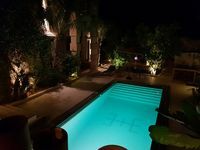 The house has a private pool, located between Agadir and Taroudant. Property 25: The house has a private pool, located between Agadir and Taroudant. Property 26: The Tafoukt Palace: 2 magnificent Riads in the middle of a huge Garden of Eden. Property 30: Rare! Charming property in a beautiful park. Pool and hammam. Nous avons ete tres bien accueillis par Rachid, qui est plein d'attentions. La maison est superbe et la nourriture delicieuse. Excellent rapport qualite prix. Second visit to this splendid riad. Aicha was waiting for us with a scrumptious pastille and chocolate cake! What treats. It was very hot so we stayed pretty much chez nous and dashed out to the souk when necessary. This Riad and Taroudant is a well kept secret, lets hope it stays that way. Thank you to Aicha and all her lovely family for making us so welcome.